Pick any 16 oz. flavor that you want. Choose from our Salsas, Dills, Sweet, relishes, fresh pack and candied.Please check the individual flavors for ingredients list. From Tabby T. of Muncie, Indiana on 3/19/2019 . Absolutely LOVE the sweet pickle mix & Hungarian pepper relish, we have been fans of your products for years and were saddened by the lack of stock in our area since Marsh stores closed. Now I can buy online & have it shipped to me! We will not go without your products anymore!!! Thanks so much! From John Kubiak of Great Falls, Montana on 3/15/2019 . I bought these as a gift for a relative who loved them - especially the onions. The items were packed well and shipped promptly. From Amelia Getz of Kokomo, Indiana on 1/19/2019 . From Anonymous of Brazil, Indiana on 1/12/2019 . 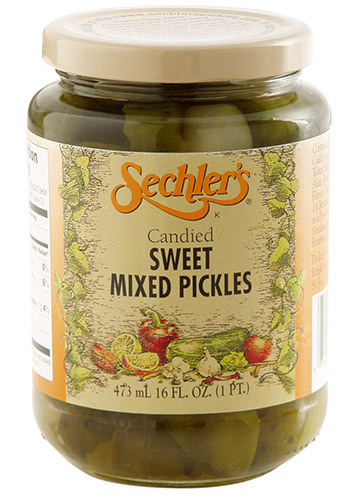 Our family alway count Sechler's pickles as a treat. We had a few stores that used to have Sechler's products, but for whatever reason they no longer do. We recently ordered a 4 pack to introduce our family in Texas to Hoosier pickles. They loved them. Mail order will be in our future for certain. Thank you, Sechler's! From Anonymous of Fort Wayne, Indiana on 12/30/2018 . My friends in Vermont loved your pickles! I liked being able to select the flavors for them in the 4 Pack Customer's Choice Assortment. Being online made selection, ordering, and sending them really easy. The only hard part was deciding which flavors to send! Yum!